Launches first space in Bangalore. PUMA revolutionised the concept of retail spaces in India with the opening of its first sustainable store in Indiranagar, Bangalore. The store is locally developed, sourced out of India, and incorporates a number of revolutionary design elements to ensure that it meets the highest criteria for sustainability. This remarkable achievement is in keeping with PUMA’s vision of being the most desirable and sustainable Sportlifestyle brand. Poised to be the flagship store for PUMA in India, the store is a global first for the brand. 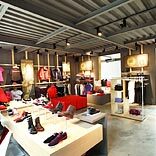 Conceived by PUMA India in collaboration with the PUMA EEMEA (Eastern Europe, Middle East & Africa) Regional Office, the store is spread over a total of 5000 sq. ft and incorporates the elements of sustainability through innovative design, mechanical and electrical installations, and material selections. While the lower levels will function as a retail area, ‘The PUMA Social Club’ cafe and bar will be located on the upper floor and terrace, and will be ready to open by the end of 2012. “In keeping with our vision of being the most desirable and sustainable Sportlifestyle brand, PUMA is happy to take this giant step forward for the retail industry. The building is a true design marvel, and incorporates a host of innovative features to make it a one-of-a-kind store. It has been an honour to establish PUMA’s first sustainable retail space in India,” said Rajiv Mehta, Managing Director, PUMA South Asia. “PUMA is happy to take this pioneering step forward for the retail industry. Establishing a sustainable PUMA store underlines our commitment to reduce CO2 emissions, energy, water and waste in PUMA offices, stores, warehouses and direct supplier factories by 2015”, said Franz Koch, CEO of PUMA.